Rui applied for the Mitacs’ Globalink Research Internship in the summer of 2014 —hoping to be accepted to the School of Interactive Arts and Technology (SIAT) at SFU. He was accepted to the internship, which would be supervised by Associate Professor Carman Neustaedter, to study interactive computing and design. “I got to be a part of a real lab and participate in real research,” says Rui — something he had not previously done in his studies back home as an undergraduate student. He was excited to take his first trip to North America and be surrounded by cutting-edge technology, but it was the research itself and working alongside his colleagues and other grad students that really added to his enjoyment of the program. When his internship concluded, Rui went back home to finish his degree at the University of Electronic Science and Technology of China. He was soon contacted by Professor Neustaedter to see if he would be interested in coming back to Vancouver to continue working with him. Rui couldn’t refuse. 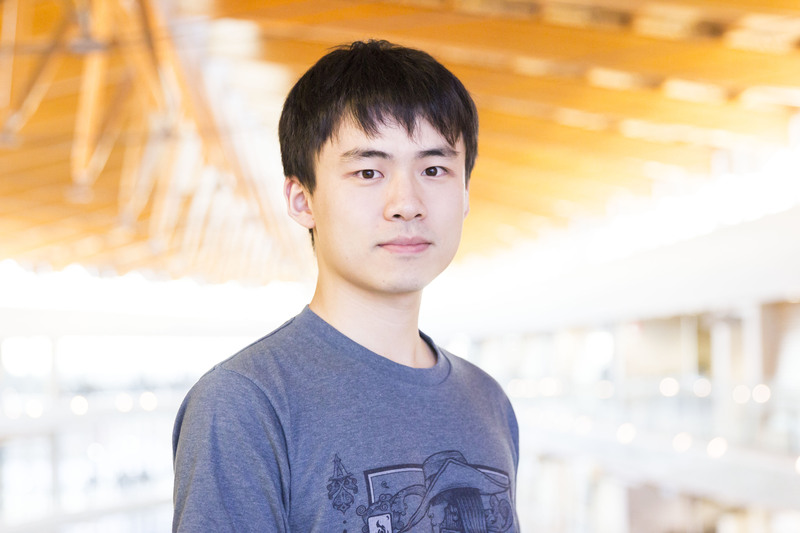 Today, Rui is working in the Connections Lab (C-lab) at SFU, supported by a Globalink Graduate Fellowship. As part of his thesis, Rui is designing a first-person video chat system for long-distance couples using cardboard goggles and a smartphone. Partners that are separated by distance can see each other’s view on their screen. Rui’s study results show that the system could be an intriguing way for couples to stay connected and build a strong relationship even if they are geographically separated. Rui hopes to remain in Canada to continue his studies and hopefully, find a career in his field — one he now feels more prepared for thanks to his involvement with the Globalink program. He also had the opportunity to publish the study he conducted during his internship to the journal companion to the Conference on Computer-Supported Cooperative Work and Social Computing in 2015. While the fellowship provided financial support for his studies, Rui says that Canada is overall, just a great place to do research. Mitacs thanks the Government of Canada and the Government of British Columbia, for their support of the Globalink Research Internship in this story. Across Canada, the Globalink Research Internship program also receives support from Alberta Innovates, the Government of New Brunswick, the Government of Newfoundland and Labrador, the Government of Nova Scotia, the Government of Ontario, the Government of Prince Edward Island, the Government of Quebec, the Government of Saskatchewan and Research Manitoba.